GPD Pocket Mini Laptop For Sale Buy!!! GPD Pocket is the leader and practitioner for the next generation of laptop. Our ultimate goal is to put the laptop in the pocket. 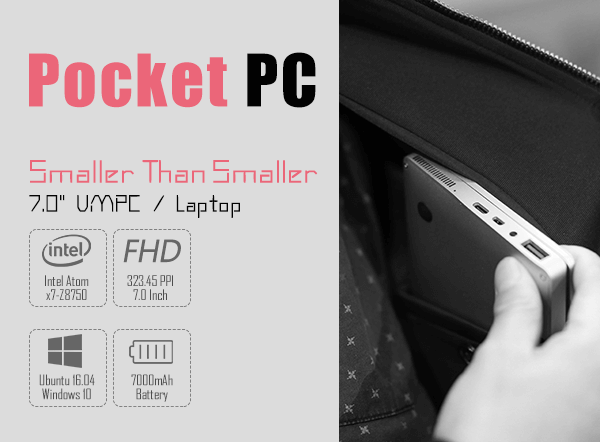 GDP Pocket is such a product, it's not only has luxuriant appearance like Macbook, but also super light and very small, It can be taken away at any time like a mobile phone in your pocket. 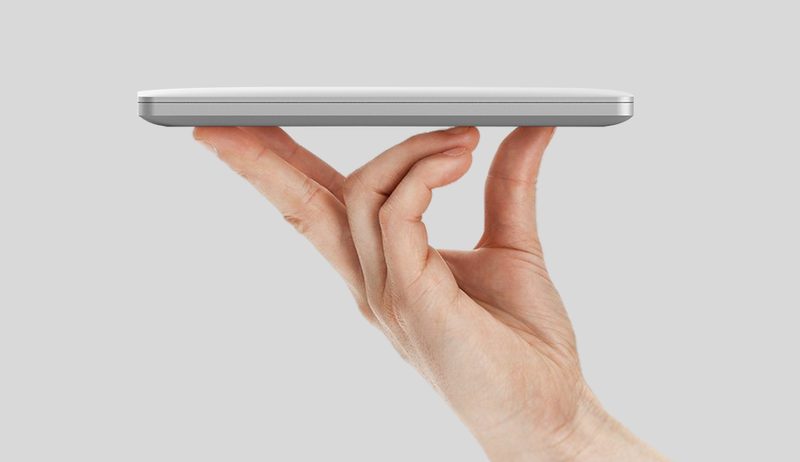 Pocket's exquisite and small appearance can be comparable to the MacBook Air. 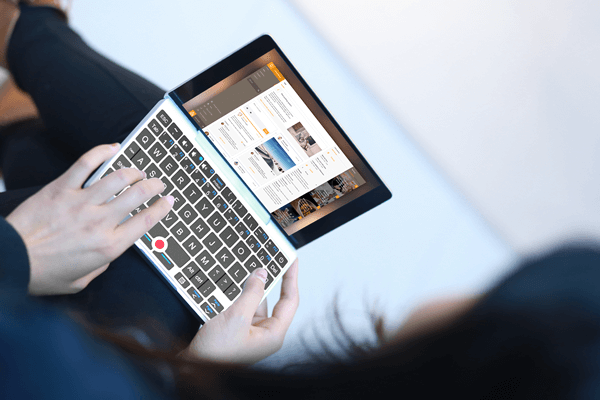 With the same configuration (4GB/128GB), Pocket uses active cooling design which means that the performance will be far beyond the Microsoft Surface 3 while the weight is much lighter than the latter. Through the HDMI HD cable, it can connect to any display to become a PC computer so as to exploit the performance to the maximum. 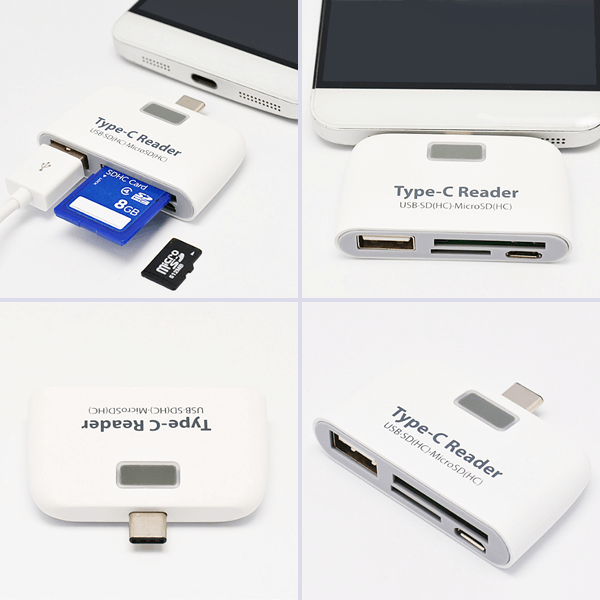 The new Type C interface can be infinitely expanded with peripherals. 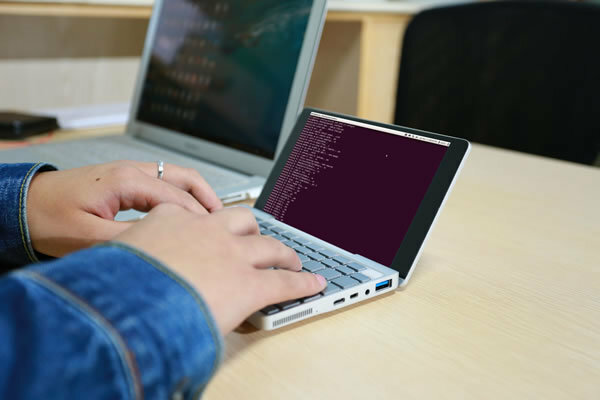 At the same time, it is the world's first pocket laptop with 7-inch screen to support 64-bit Ubuntu 16.04 LTS. Of course we will also provide Windows 10 firmware which meets the needs of Windows users. If you want, you can access mobile network anytime and anywhere through an external 4G network interface card with a USB port without opening the phone hot spots. Even if you forget to bring a mobile phone, you can communicate with any corner of the world through the Skype Internet phone, which is so cool! Our obsession with smart portable devices is no less than that of any geek. 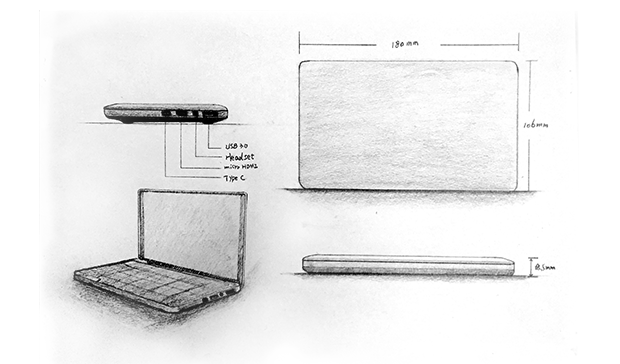 That's why we're developing this ultra-compact laptop. With your laptop in your pocket, you can do things that must be done with your desktop and connect the monitor to the laptop as a host. 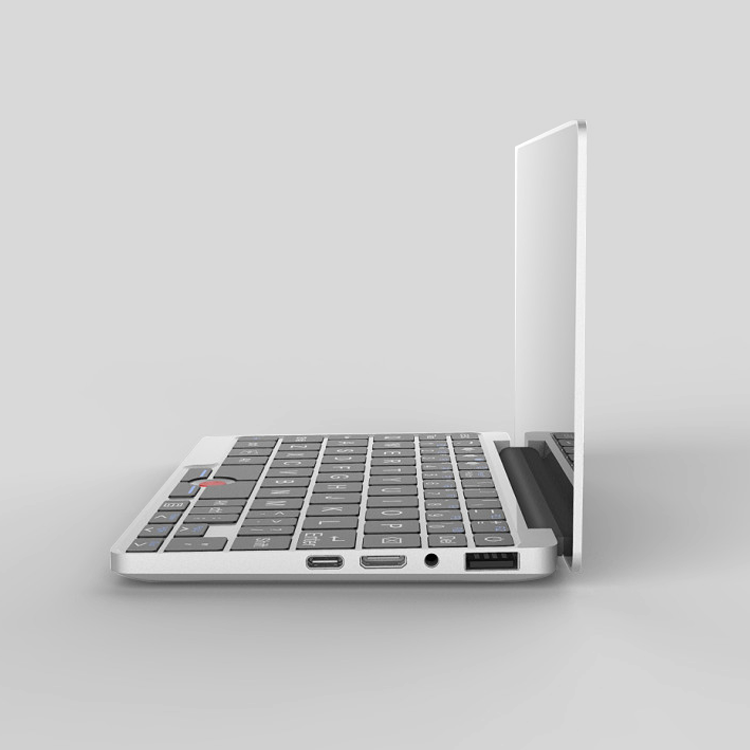 Pocket is the leader and practitioner for the next generation of laptop. Our ultimate goal is to put the laptop in the pocket. 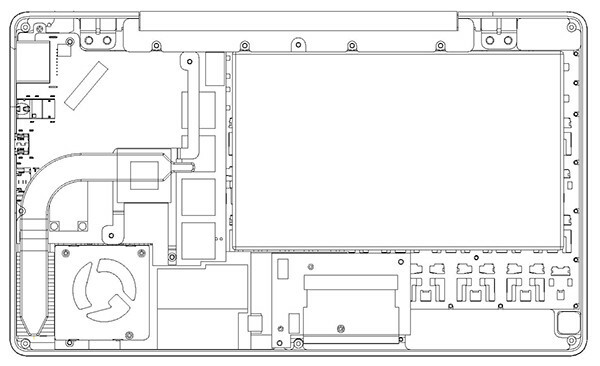 This pocket laptop adopts pure silver CNC precise all-in-one body made of magnesium and alloy, which means that its craftsmanship can be comparable to the MacBook Air. 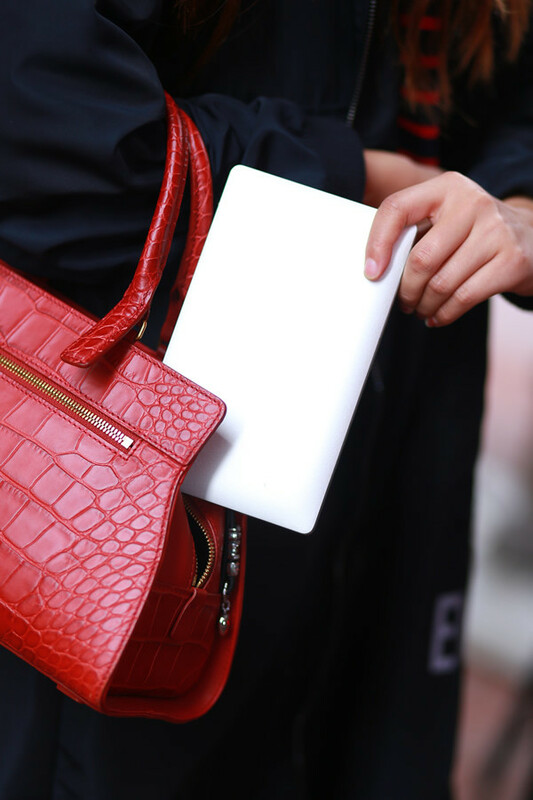 Because of its portability, we believe it will become the first choice for fashion women. Imagine a scene where a fashionable woman takes a 7-inch laptop from her shoulder bag with a cup of coffee placing next to her. She drinks coffee while gracefully typing the text on her keyboard to chat with the girlfriends. 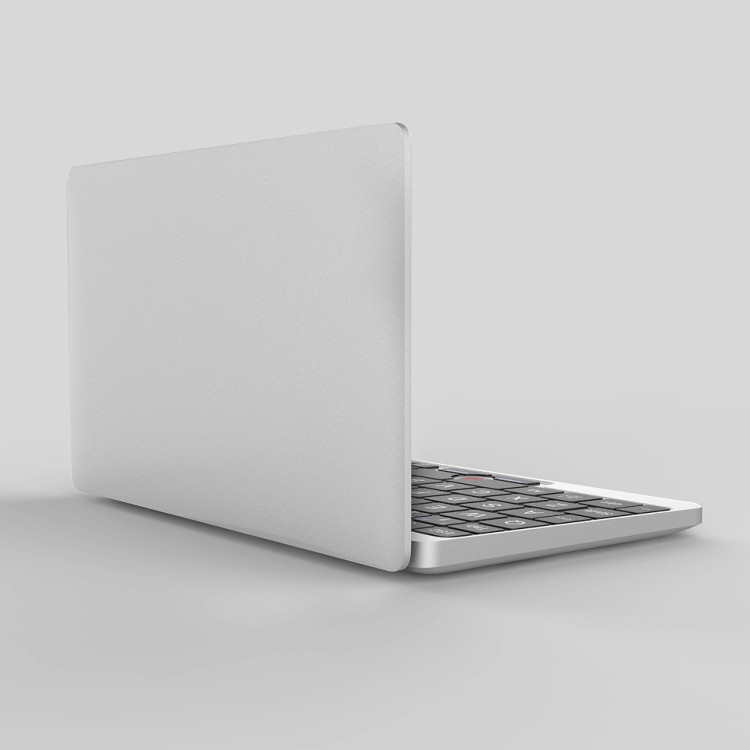 I believe a lot of fashionable women will be crazy to have such a pocket laptop. Otherwise, she needs to carry a bulky MacBook Air. A Linux engineer drinks coffee while opening Vim to program scripts with Pocket. Isn’t it all fashionable people’s dream? As we all know, higher resolution will bring richer colors and fineness. Pocket with more than 300PPI pixel density has been beyond the "retina" level screen proposed by Apple. For portability, performance and heat dissipation, we choose the currently most top-class Intel x7-Z8750 with 4-core 4-thread design and 8GB LPDDR 3 RAM, 128GB eMMC and 7000mAh polymer lithium battery. It has 12-hour battery life, built-in copper radiator pipe and large-diameter heat output pipeline. It increases the fan’s driving-power so that the body is always maintained blow 38℃ acceptable for the human body. Due to the active cooling, its performance is much better than that of Surface 3. Pocket has a Type C interface which provides the body with power supply. In fact, Type C interface’s expandable peripherals are very rich. The peripherals can not only transmit data in high speed but also output audio and video. To achieve that, only a Type C to HDMI or Type C to DisplayPort data cable or a headset based on the Type C interface is needed. Theoretically, the transmission speed of Type C is up to 5.0Gbps (500MB/s). At the same time, Pocket also provides a USB Type A interface. You can connect to any USB-based peripherals such as printer, USB flash disk, USB Hub, scanner, speaker, and wireless keyboard. 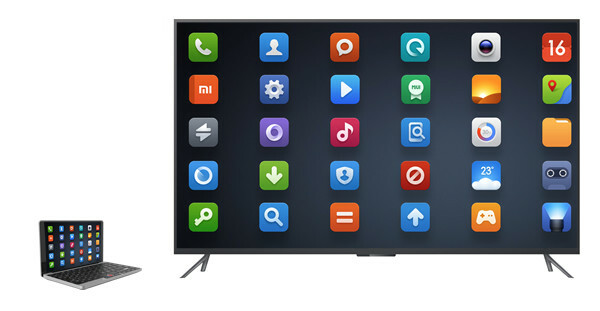 Of course, you can also output high-definition videos in the Pocket to the TV through the HDMI D Type interface. 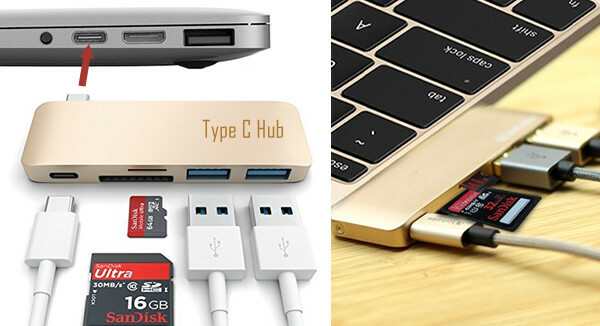 Don't worry about the limited ports, you can use the Type C Hub to connect many external devices such as network cable,TF card,mouse,keyboard,projector and U disk,etc. What is more, you can also use them when charging this device. As for input, Combined with ergonomics. Our design adopts the chocolate keyboard (plane island keyboard) that has won the highest award of the 2009 German Red Dot Award. Increase the contact area of finger and keycap. This leads to more accurate keystroke and more comfortable keyboard input than that of Surface 3. So it is very suitable for woman’s delicate fingers. At the same time, non-adhesive design also Reduce the rate of wrong input. 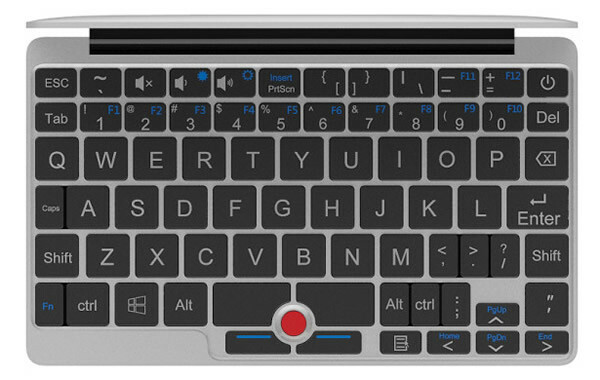 Compared with a traditional keyboard, both the key process and key spacing of Pocket are significantly improved, increasing the comfort of operations. In order to meet the needs of Linux and Windows users, in the system selection, Pocket will provide Ubuntu 16.04 LTS and Windows 10 Home. As the "kindest" and most popular Linux system, Ubuntu can shoulder a responsibility. 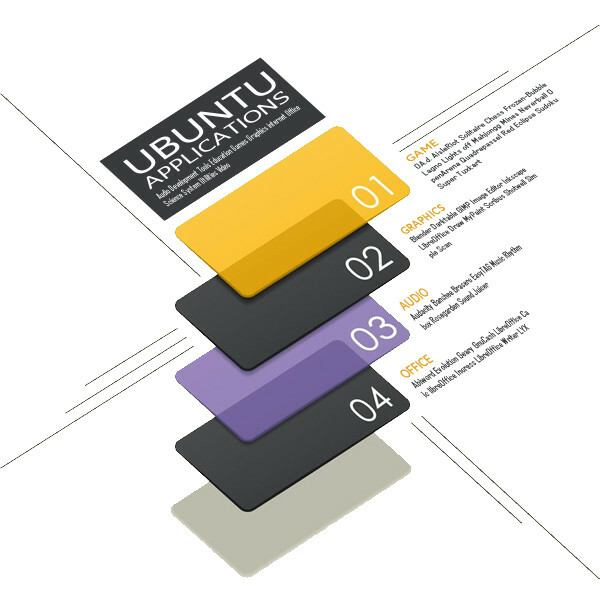 Ubuntu can achieve all the features on Windows. The open-source LibreOffice office suite provides the most popular software similar to Word, Excel and Power Print on Microsoft Office. And you do not have to pay a penny for it. Not only that, Steam platform has a client for Ubuntu. That is to say you can download and play Steam games on Ubuntu. You can even use Chrome for Ubuntu to play Android games. As long as you like, there is no function Ubuntu cannot achieve. 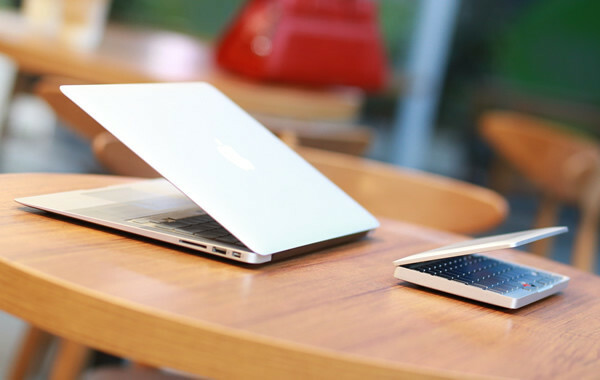 Pocket's portability makes work anytime and anywhere possible. As a software developer, I believe no one will deny that the Shell of Linux is N times better than that of Windows. The shell of Linux and text editor Vim are universal development tools. No matter what is to be developed, it will be used to avoid the cost of learning a variety of IDEs. And many tools can only run on Unix-like systems (Linux and OS X), for example, Spark, Hadoop and Web framework Meteor that are used for distributed data analysis and cannot be installed on Windows, let alone be developed. This is also the main reason why many programmers develop on Linux. Pocket supporting Ubuntu is to make it easier for programmers anytime and anywhere to program. BackTrack 5r3, Nodezero, BackBox Linux, Blackbuntu, Knoppix STD and other systems, as Linuxes used by white hat hackers for penetration testing, are the most popular and well-known hacker release versions based on Ubuntu. This means that Pocket supports Ubuntu. And at the same time, it may also support these hacker systems. After all, these systems are based on Ubuntu. And the drive of Ubuntu can also be applied to these systems. We successfully launched GPD WIN handheld device. At the same time, we were confident to run Windows 10 system on Pocket. In fact, we believe that user groups of Windows prefer such a pocket-type laptop. In the field of light office such as securities trading, table editing, text composition, PPT design and presentation as well as sending e-mail, high performance isn’t needed. Just with an external TV or monitor, Pocket can bring an excellent user experience. In order to achieve such a product with appearance more beautiful than that of MacBook, performance better than Surface 3 and portability as a mobile phone, we have gone through nearly a year of creation and design. Only we ourselves can understand the painstaking. From the earliest concept and creative sketch design to the 3D printer model and structural design, until today, the prototype has been basically completed. We have paid a huge cost. The reason why we raise funds in the Indiegogo is that the Pocket’s mould, research and development as well as components procurement costs are expensive. All the funds we raise will be directly used for this product’s mass production. We believe that such a product will touch all geeks who like portable devices. We really hope that you will support this project. For Pocket, let us work together! Supporters on Indiegogo will be rewarded first. The specifications may change during the process of raising funds to ensure the best performance of the machine. 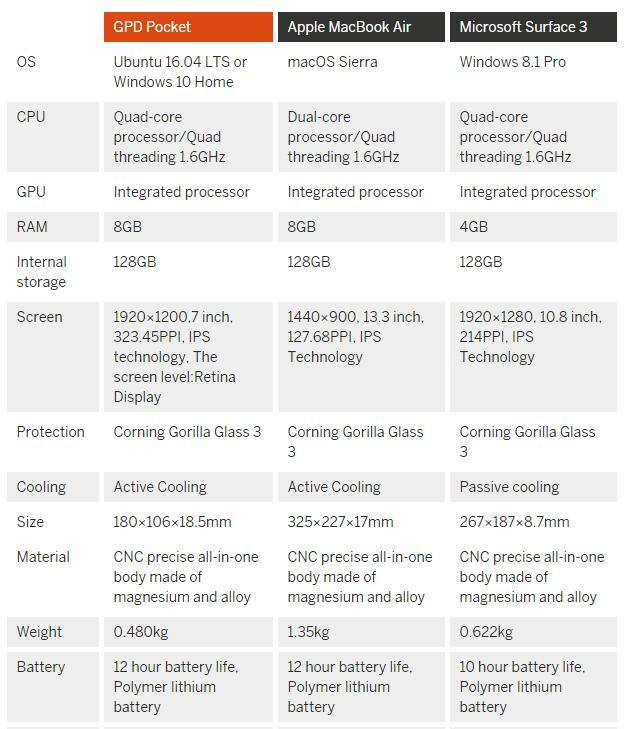 About the operating system, we will provide Ubuntu 16.04 LTS and Windows 10 Home for the users to choose rather than the built-in dual system. Raised funds include the freight of international express and the surcharge of remote areas. 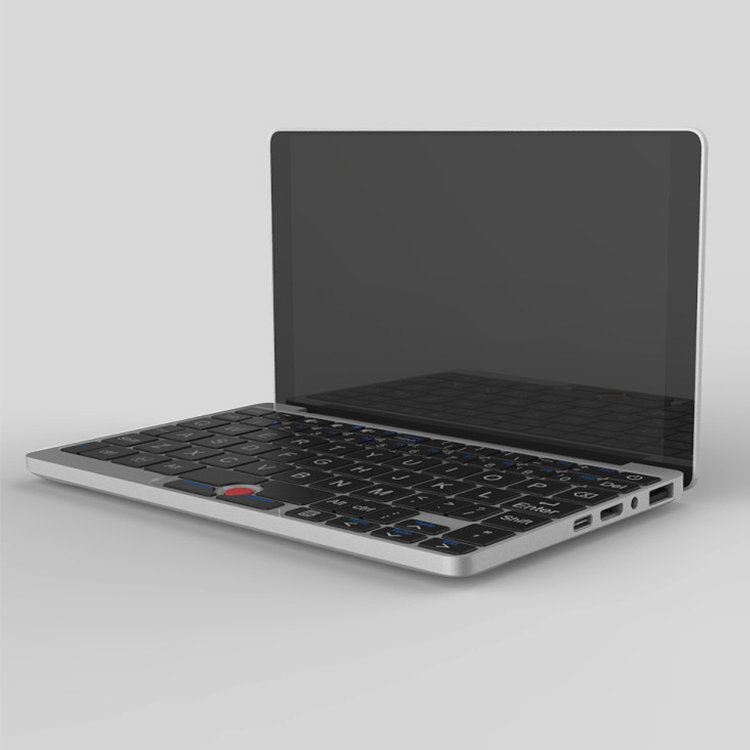 Where can buy gpd pocket?